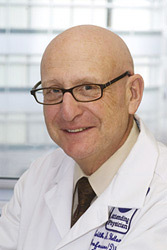 Keith S. Heller, M.D. was born in Brooklyn, New York, and grew up on Long Island. After receiving his undergraduate degree in Biophysics from Amherst College in Massachusetts, he returned to New York City where he graduated from the New York University School of Medicine and then completed training in General Surgery at NYU and Bellevue Hospitals under Dr. Frank C. Spencer. In 1978 he began a Surgical Oncology fellowship at Memorial Sloan-Kettering Cancer Center where he was exposed to Head and Neck Surgery for the first time. In an era before formal Head and Neck fellowships, he was able to spend more than one year of his fellowship training with Drs. Elliot Strong, Ronald Spiro, and Jatin Shah all of whom inspired him to pursue a career in head and neck surgery and have continued to mentor him through the years. Following his fellowship, he joined the late Dr. Joseph Attie at Long Island Jewish Medical Center where he rose to the position of Chief of Head and Neck Surgery and Clinical Professor of Surgery at the Albert Einstein College of Medicine. At Long Island Jewish, he held joint appointments in Surgery and Otolaryngology and was actively involved in the education of residents in both specialties. In 2007 he returned to the New York University School of Medicine as Professor of Surgery and Chief of the Division of Endocrine Surgery. Dr. Heller is a past president of the American Head and Neck Society and has been president of both the New York Head and Neck Society and the New York Cancer Society. He had been a member of the Society of Head and Neck Surgeons and the American Society for Head and Neck Surgery, and was one of the leaders of those societies who worked together to create the American Head and Neck Society. In 2006 he was honored by that society as its Hayes Martin Lecturer. He is also a member of the American Association of Endocrine Surgeons and the American Thyroid Association. Dr. Heller has published extensively on head and neck cancer surgery. His current clinical research interest is the surgical treatment of diseases of the thyroid and parathyroid, an area in which he has a very large personal experience. He was married in 1968 to his wife, Honey, who after a career as an international banker specializing in Latin America now devotes her efforts to community activism and social justice. In 1997 they received the Allard Lowenstein Award of the American Jewish Congress for their work together. They now live in Manhattan after raising their two sons on Long Island. Jared, 30, is a lawyer in New York City. Gregory, 22, is a TV producer in Sun Valley, Idaho.